The federal budget puts a down payment on improvements to First Nations schooling, but the young people who have led the charge for better funding in native schools say the $275 million is inadequate. The education funding is the centrepiece of a First Nations package that includes renewal of money for clean water as well as a commitment to explore allowing private-property ownership on reserves that want it. It comes as Aboriginal Affairs' budget is cut by $166 million a year, or 2.7 per cent. "We will work with First Nations to … unlock the potential of Canada's First Nations children," Finance Minister Jim Flaherty said in his budget speech. The goal of the education money is to bring First Nations schools up to a high enough standard that they can participate in a new governance system — similar to school boards — to be in place in 2014. The $275 million includes $100 million for early literacy programming and other supports, as well as $175 million for building and renovating schools on reserves. 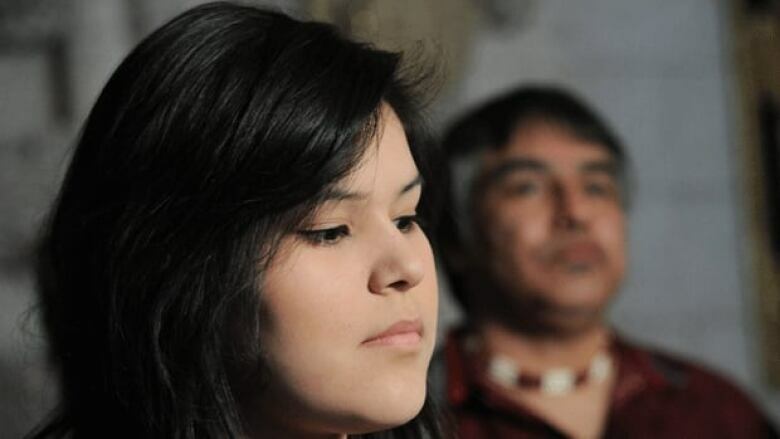 But that's only a sliver of what First Nations need just to get started, said Chelsea Edwards, the 16-year-old who is the voice of the Shannen's Dream initiative to bring provincial standards to reserves. "We need about $500 million a year to give the students everything they deserve," Edwards said in a telephone interview from Timmins, Ont. "(Aboriginal Affairs Minister John) Duncan seems to think we can get by with just 20 per cent of this." She noted it's costing about $30 million to build a school in nearby Attawapiskat alone, so $175 million for new buildings won't go very far. The Conservatives recently backed an NDP motion in the House of Commons that committed the government to bringing First Nations schools up to provincial standards. But the funding falls far short of the $500 million the Assembly of First Nations says is necessary to set native schools on an equal footing with provincial schools. Nor does the measure lift the two-per-cent cap on funding increases that First Nations have decried as inadequate. First Nations young people are the fastest growing demographic in Canada, but only half of them graduate from high school — exacerbating the high unemployment and poverty that undermine many reserves. But Flaherty, in his speech, suggested there may be more money to come, calling the new funding "initial steps" in improving First Nations education. For clean water, the budget renews funding for First Nations to build and renovate water infrastructure on reserves, putting $330 million over two years into the initiative. A similar amount was set to expire shortly. But again, the funding falls far short of what experts say is necessary to supply reserves with clean, safe water. A national assessment commissioned by the federal government recently found that $4.9 billion over 10 years is what it would cost to improve and maintain water systems. The Conservatives have introduced legislation meant to ensure First Nations have access to safe and reliable drinking water, but no funding was attached to the bill. Critics have complained that there is no point in passing legislation that First Nations don't have the means to implement. As for owning private property, the budget reflects the belief held by many Conservatives that the key to First Nations prosperity is ending the collective ownership system that dominates reserves right now. The idea is controversial, however, since many First Nations believe it will erode their traditional hold on the land. The budget signals that the government will not force private property ownership on anyone. Rather, Ottawa will "explore with interested First Nations the option of moving forward with legislation that would allow for this." The hodge-podge of measures amounts to a big let-down after Prime Minister Stephen Harper raised hopes and expectations in his summit with First Nations leaders in January, said Chief Isadore Day of the Serpent River First Nation, in southern Ontario. "A new fiscal relationship is not what this budget represents. We as First Nations needed substantive commitments, not substandard contributions to known solutions." The national chief of the Assembly of First Nations applauded the new money for education, but said more is needed. "The investments in education in today's budget indicate that the voices of our youth are perhaps beginning to be heard but we must do more," Shawn Atleo said in a statement. "We will be relentless in our efforts to ensure sustainable and secure funding for education."